Last updated on Monday, February 27, 2017. Varroa destructor has been observed in 1985 for the first time in Luxembourg (Meisch 1986). Since then it has spread throughout the country and is nowadays present in every beehive. ISEIA protocol: A3 (3+3+3+3) = Black List (Ries et al. 2017: 68). Meisch, C., 1986. Die Varroamilbe. Geschichte der Ausbreitung, Portrait und Biologie. Pp. 174-177 in: Livre d’or du centenaire 1886-1986. Fédération des unions d’apiculteurs du grand-duché de Luxembourg. Distribution map of Opilio canestrinii (Thorell, 1876) in Luxembourg. Recorder database, MNHNL, 20.04.2019. The first documented occurrence of the species in Luxembourg dates from 2009. It was found by C. Muster on 20th August 2009 in Fort Berlaimont (Municipality of Luxembourg). Opilio canestrinii is the second most common harvestman in Luxembourg and can be found in every region of the country. Opilio canestrinii colonises a number of open habitats independently of their moisture. It is very successful in man-made landscapes, even in bigger cities. It is a strong competitor for native species and seems able to displace or even replace those. There are indices that the similar Opilio parietinus, traditionally a common species on house walls, has nearly vanished just a few years after the arrival of O. canestrinii. Several sources describe this harvestman as a typical species of urban areas. In Luxembourg however, the data provided from different projects show evidence that the species occurs in great number and important percentages even in close-to-nature areas. Since the sixties, O. canestrinii has spread extremely quickly northwards through Europe and has become a more or less common species in his new areas. ISEIA protocol: B3 (3+2+3+1) = Watch List (Ries et al. 2017: 68). Distribution map of Leiobunum blackwalli in Luxembourg. Recorder database, MNHNL, 20.04.2019. The species was first documented for Luxembourg in 2009 (M. Meyer & C. Muster). Big clusters of the species (100-200 animals) have been observed in Rodange and Esch-sur-Alzette in the south of the country. The other findings were individuals or small groups of at most 10 animals. The species is common in the Gutland area while largely missing in the Oesling (Muster & Meyer 2014). Leiobunum species generally tend to cluster together during daytimes. This behaviour is even stronger pronounced in the species in question. Mass aggregations of several hundreds of individuals have been observed. Many observations show that in spite of its high reproduction rate this “new” Leiobunum species seems to coexist well with indigenous species and integrates in the native fauna without greater damages. But surely great colonies of the species compete for food with other similar predators. Distribution map of Leiobunum religiosum in Luxembourg. Recorder database, MNHNL, 20.04.2019. Distribution map of Dermacentor marginatus Leach, 1815 in Luxembourg. Recorder database, MNHNL, 20.04.2019. The tick Dermacentor marginatus was first documented for Luxembourg by Svenja Christian on 17th November 2015 in Wellenstein (Municipality of Schengen) near the Moselle valley. Preferring dryer and warmer climate, this tick species is very likely to benefit from climate warming. ISEIA protocol: C1 (2+1+2+1) (Ries et al. 2017: 68). Cheiracanthium punctorium was first documented in 1988 at the nature conservation reserve Aarnescht near Oberanven, municipality of Niederanven (Hermann 1998). Only two observations of the species are documented in the Recorder database, the first from 2000 (Aarnescht near Oberanven, municipality of Niederanven), the second from 2014 (Haard, municipality of Dudelange). Cheiracanthium punctorium lives in grasslands with preferably high-growing stalks. The species is rather thermophile and therefore geographically restricted to the south of Luxembourg. Most observations have been made in dry grassland in the Moselle-valley. Climate warming may favour further spread of the species. Being rather similar to several native Cheiracanthium species in its biology, C. punctorium should have no greater influence on the composition of native prey species in a colonised biotope. There may however be a certain competition with similar predators. The species is known as quite aggressive when disturbed, especially pregnant or egg-protecting females. The chelicerae (fangs) of bigger individuals can easily penetrate through human skin and inject their venom. A bite of C. punctorium is painful and causes itching and swellings, sometimes stronger reactions like vertigo, nausea, shivering, circulatory collapse and light fever. The symptoms usually decline after 24-30 hours. As the species leads a rather hidden life-style, the probability for bites should be rather small. There is a certain, but unfortunately sometimes overstated, media exposure of the species and its venomousness. Thiel, M., 2016. Ein unheimlicher Zuwanderer. Eine südeuropäische Giftspinne zieht zunehmend nach Norden. Luxemburger Wort, 14.9.2016. Distribution map of Argiope bruennichi (Scopoli, 1772) in Luxembourg. Recorder database, MNHNL, 20.04.2019. 57 occurrences of the species are documented for Luxembourg in the Recorder database (25/01/2018). Dr Feltgen first observed the species on 24.08.1906 in a garden in Lintgen (Weinachter 1906). The species can be considered as widespread in the Grand-Duchy. 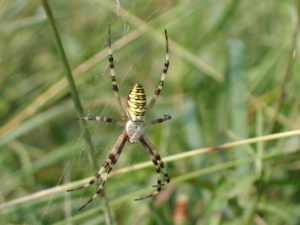 On sites where this strikingly marked spider occurs, the individual number can be very high. Argiope bruennichi populations might be a certain threat for rare species of their favourite prey and provoke changes in invertebrate communities of conquered sites. However the spider seems to integrate rather well in invaded countries, causing no great damages. The rapid spread of the species across Europe is generally thought to be facilitated by climate warming. ISEIA protocol: C3 (2+2+2+2) (Ries et al. 2017: 68). Weinachter, P., 1906. Comptes Rendus des Séances Fauna 16, 10: 215 (Original article at eluxembourgensia). Red swamp crayfish ISEIA: A0 – Alert List. IAS of EU concern. There is no documented occurrence of the species in Luxembourg yet. ISEIA protocol: A0 (3+3+3+3) = Alert List (Ries et al. 2017: 68). Last updated on Friday, April 13, 2018. On 22nd May 1991, Gammarus tigrinus was found in the Moselle river across from Bech-Kleinmacher, municipality of Schengen (Massard & Geimer 1992). Dhur (1993) showed that G. tigrinus was present in that river all the way from Schengen to Wasserbillig. There are no indications of the species in the Recorder database though. Gammarus tigrinus has eliminated some native species in parts of the Rhine River and the Baltic Sea; it is frequently a superior predator in comparison to indigenous species. ISEIA protocol: C2 (3+1+3+1) (Ries et al. 2017: 68). Dhur, G., 1993. Etude des espèces d’invertébrés immigrées ou introduites dans la Moselle luxembourgeoise et dans les écosystèmes aquatiques qui en dépendent. Historique et répartition actuelle. Centre univ. Luxemb., Dép. Form. pédag., mém. sci., 213 pp. Last updated on Thursday, February 21, 2019. Dikerogammarus villosus is not yet present in Luxembourg and has been listed in the Alert List. The crustacean is an omnivorous predator tolerating a wide range of temperatures, salinity, oxygen concentration and different substrates. By its aggressive behaviour and high voracity in invaded ecosystems, it is a serious threat for indigenous species. It is feeding on other invertebrates and on eggs, larvae and at times even adults of fish species it causes changes in the composition of invaded communities or even diminish their biodiversity. The high fecundity of D. villosus supports its rapid expansion through Europe. ISEIA protocol: A0 (3+2+3+3) = Alert List (Ries et al. 2017: 68).